London - Oscar Pistorius and Arnu Fourie qualified for the men’s 100m T44 track final, winning their respective heats, and Dyan Buis won a long jump bronze medal at the Paralympic Games in London on Wednesday night. 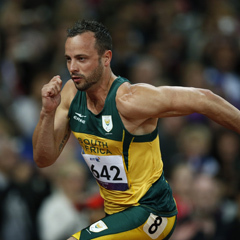 Pistorius stormed home in 11.18 seconds in the second heat while Fourie won his heat in 11.29. Only Britain’s Jonnie Peacock ran a better time, setting a personal best of 11.08. Peacock’s heat comprised US sprinter Jerome Singleton (11.46) and the Brazilian winner of the 200m final last Sunday, Alan Oliveira, who clocked 11.56. Americans Blake Leeper, who ran second to Pistorius in 11.34, and Richard Browne, who came in behind Fourie, in 11.33, together with China’s Zhiming Liu (11.84) make up the numbers for Thursday’s final. Pistorius rushed passed the media after his heat to join the rest of his relay team in preparing for the 4x100m event and hour later. “It’s good to be back and I will speak to the media after the relay,” said Pistorius after his heat. Fourie had time for a quick chat after he won the third of the 100m heats. “I had to work a little harder than I expected as I didn’t get out of the blocks too well,” Fourie said. Fourie had the added disadvantage of a restart to his heat so he had to be more cautious the second time around. “We didn’t know what happened or why we had to restart, so that affected us a little bit. Buis won the bronze medal in the men’s F38 long jump, to accompany his silver in the men’s 100m, and set a new world record in his class with a leap of 6.48m. “I came here wanting to break the world record so I was so happy when I got it,” said Buis. “I felt it in the air because everything was in sequence and I knew it was a great jump." “I’m happy that I’m the best in my class and I still got a medal for my country and that’s something to be proud about,” he said. “It’s the first time I’ve competed at a Paralympics and I’m first in the F38 class so that’s what counts. “Riversdale (his home town in the southern Cape) has gone crazy and I’m so glad to keep them on a high. His medal takes South Africa’s tally to 16 - three gold, five silver and eight bronze. “I’m very happy with my result and I think there’s a lot more to come from me,” said Dalle Ave.
Zanele Situ just missed out on a medal in the women’s javelin F54/55/56, finishing fourth with a best throw of 16.22m. The event was won by Liwan Yang with a world record heave of 17.89m. In the pool, Shireen Sapiro, who won a bronze medal on Tuesday night, came last in the women’s 400m freestyle S10 event, in 5:01.30, slower than her 4:59.54 African record she set in the heat. The race was won by France’s Elodie Lorandi in 4:34.55 while Canadian Aurelie Rivard and American Susan Scott won the silver and bronze medals in 4:36.46 and 4:37.23, respectively. While Kevin Paul failed to medal in the men’s 400m freestyle S10 final, finishing seventh, he bettered his earlier African record, touching in 4:16.46. Ian Silverman of the US (4:04.91), France’s Benoit Huot (4:06.58) and Britain’s Robert Welbourn in 4:08.18 were the podium finishers. Natalie du Toit finished seventh in the 50m freestyle S9 final in 29.84. Ping Li of China won the gold medal in 29.12. Tadhg Slattery finished fifth in the men’s 100m breaststroke SB5 in 1:39.16 with Woo-Geun Lim of Korea in 1:34.06. Cyclist Ernst van Dyk rode the individual H4 time trial in 26:35.95, coming fifth to Italy’s Alessandro Zanardi who won the gold medal in 24:50.22. Gerhard Viljoen and Madre Carinus finished seventh and 12th in the mixed T1-2 time trial which was won by Australia’s Carol Cooke in 13:50.54. Stuart McCreadie finished seventh in the men’s individual H2 time trial in 29:03.51. The event was won by Switzerland’s Heinz Frei who rode the race in 26:52.39.